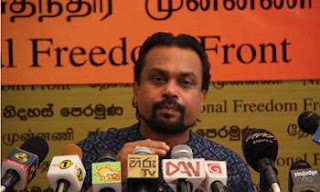 The Indian Minister of State for Civil Aviation and Minister of Civil Aviation of Sri Lanka had expressed contrary statements on the Mattala International Airport (MRIA), Freedom Front (NFF) leader Wimal Weerawansa said yesterday. of discussions with Sri Lanka on the lease of the Mattala Airport. “Although the subject Minister of India says so, our Minister of Civil Aviation Nimal Siripala de Silva says otherwise. He says discussions are continuing to take place with India on Mattala Airport. It is puzzling as to why the two subject ministers express contrary statements on same matter,” the MP said. However, Weerawansa said both of the subject ministers were attempting to conceal the actual scenario on the Mattala Airport. “According to Minister Nimal Siripala, the Indian Airport Authority and Sri Lanka are hoping to establish a Joint Venture Company to control the Mattala Airport, where 70% shares will be bought by India,” he added. Meanwhile, he said India was keeping an eye on not only to grab Mattala Airport but also airports in Kankesanthurai, Palali and harbours in Galle and Trincomalee.